When browsing with Safari from OS X Mountain Lion, you can mark favorite websites. When you find a web page you want to remember and return to, you bookmark it. Bookmarks are favorites, and favorites are bookmarks. Both words refer to exactly the same thing: shortcuts to websites. Safari calls them bookmarks. Some other browsers call them favorites. To return to a bookmarked page, click it in the Bookmarks Bar, select it in the Bookmarks Menu, choose Bookmarks→Show All Bookmarks, press Command+Option+B, or click the Show All Bookmarks button (shown in margin) to see all your bookmarks in the Bookmarks window. Open bookmarked pages in the Bookmarks window by double-clicking them. You can view the contents of any collection (that is, a folder full of bookmarks) by clicking its name in the Collections pane on the left side of the window. 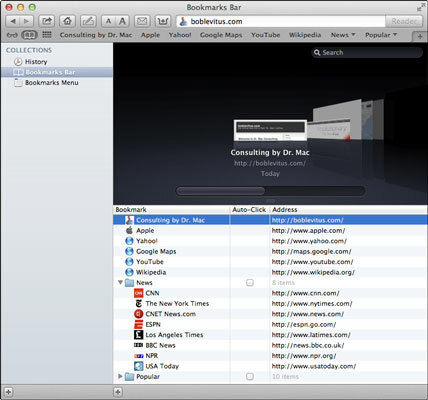 The figure shows, in particular, the contents of the Bookmarks Bar folder with the contents of the News subfolder expanded. To organize your Bookmarks window or place bookmarks on the toolbar or Bookmarks menu, move bookmarks by dragging them. You can place bookmarks and folders of bookmarks on the Safari Bookmarks Bar or Bookmarks menu by dragging them to the appropriate folder. If you drag a folder of bookmarks to the Bookmarks Bar folder (or directly onto the Bookmarks Bar itself), the result is a drop-down menu. To delete a bookmark, select it in the Bookmarks window and press Delete key. If you enable Auto-Click for a folder of bookmarks, you don’t get a drop-down menu when you click its button. Instead, all the pages in that folder open at once, each in its own separate tab. You can still use the drop-down menu, but you have to click and hold the button rather than just click. Conversely, if you want to open all the bookmarks in a folder that doesn’t have Auto-Click enabled, you can Command-click it to open the pages in separate tabs.